With a huge number of people now connected to the internet for a variety of online activities, how can marketers utilise the internet to develop and retail new products and services? Can researchers assist by unearthing better insights and information to these marketers worldwide? Internet evolution and the proliferation of social technologies have put more power into the hands of consumers, but what are consumers paying attention to nowadays? What characterises their online and offline behaviour and activities? Research your business market and frame your research strategies effectively. Online research has grown rapidly in recent years primarily because it is cost effective whilst offering both fast and high quality data. What are other viable benefits? Other logic related benefits such as auto-randomising of all questions and response options, along with multiple presentation of concepts, ads, packaging, etc. APAC – What are the key factors one should consider before embarking on an online study? Sample representation – Does the online population of the country closely represent the general population? This is important as it will help to reduce the sample selection bias for nationally representative studies with large sample sizes. Reaching internet-based population – What are the internet penetration rates for each market? What is the demographic profile, psychographic background and web behaviour of your target audience? If this is not already defined, then getting to know your online audience via a pilot survey is always recommended. Technology adoption and infrastructure – An understanding of the technologies used by your target audience , e.g. computer accessibility, broadband adoption rates, online communities, social networks etc, are all important when deciding how you choose to deploy and recruit for your online study. 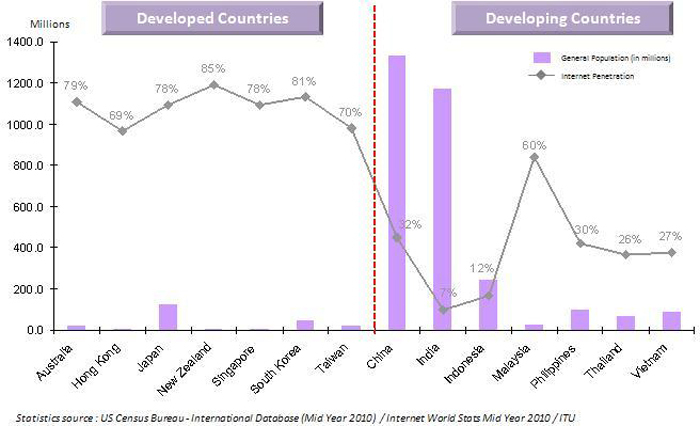 Internet penetration in APAC Recent statistics from “Internet World Stats” show that internet penetration in all developed countries remains high, which implies that these markets are more mature for online research since it contains close representation to the general population. Are developing countries ready for online research? Online research in developing countries is still young and evolving. China and India are by far the largest population centers in APAC yet internet penetration still remains relatively low. For these regions in general you might not reach certain target groups via online (especially the senior group since online population is generally very skewed to younger people or those aged below 40). Online research is still feasible if pursuing a complimentary and predefined criteria, whilst multi mode or hybrid methodologies may be considered for under-represented groups. Internet Growth in APAC China, a developing country, has the largest “netizen“ population in APAC, with India and Japan following closely behind. Australia, New Zealand and Singapore despite being developed countries, have continued to grow strongly over the last 5 years, with steady growth also observed in other developed countries. So what are the emerging markets? The overall internet population in APAC has witnessed a new level of growth in individual users. Over the last 5 years, China, Indonesia and The Philippines have experienced the most impressive growth. What does this imply? Basically a new era of online research but it will certainly take one or two more years until the full impact is appreciated. Segmentation or targeting of new opportunities in the B2C market, analysing the consumers intrinsic motivations, understanding their purchase decision making or funnel, or their brand loyalty motivations, media consumption habits, etc. Tracking the new age of influence: social media and online communities, smart mobile technology, internet, social networking, etc. Brand connection and placement within the online marketplace: how do we optimise concepts online? Digitally connected cities Undoubtedly South Korea and Japan are more advanced in their technology penetration in the context of APAC. On the other hand however broadband internet users remain virtually non-existent in developing countries like India, Indonesia, Vietnam, The Philippines and Thailand. Why is this so? Alternative access via public access points Average income internet users in Indonesia and Vietnam turn to cyber cafes, internet shops, or community-based post offices as an alternative to owning a computer, as it offers them a cheaper rate for accessing internet services. The place of work (office, school, college, etc.) remains the preferred place of accessing internet in India, while prepaid internet cards continue to be popular in The Philippines. In Thailand, Wi-Fi hotspots at shopping malls, hotels, restaurants and cafes tend to be the primary point of internet access. What are the system requirements? For online multi-country studies, researchers can easily switch the survey from flash-based to html format for developing countries. To ensure that we do not compromise survey quality and data collection, the researchers online system is capable of auto-resizing the multimedia file (i.e. video streaming, images, etc) based on bandwidth. Multiple layers of security can be employed like pairing UIDs with encrypted emails and browser versions instead of just focusing on tracking respondents' IP address. Spend time to customise your questionnaire for online remote access surveys: although internet has made research more affordable, injecting all question structures from phone surveys or face-to-face interviews directly into an online survey will most likely not yield good quality data. Lengthy questionnaires are always to be avoided: it is always more costly, with higher dropout rates, respondent fatigue and boredom. The average online attention span of an adult is less than 15 minutes, so cut out questions that do not directly inform your research objectives. Screen out unwanted respondents: if not already defined, a simple market segmentation study will definitely help to determine who to include and exclude, i.e. whose opinion matters the most? Use open ended questions sparingly: for remotely administered surveys it is best to predefine all of the response options where possible. Other factors underpinning online reach will be core demographics, social and cultural differences, internet usage, behaviours and penetration, etc. What are the future trends of online market research? Growing online population Internet penetration and usage will continue to grow in APAC, where higher adoptions of online methodologies can be observed across the market research industry. With ever decreasing fixed line connections and growing mobile broadband access, people are fast finding multiple ways to connect to the internet. Leading the change With some exciting growth and emerging trends in social media technologies, we have seen many marketers and researchers begin to increase their choice of platforms through the use of search tools, social media, blogs, RSS, etc, to enable richer conversations and develop relationships with their consumers. What are the new metrics and methods for online market research? Follow us in our next newsletter in November Social Media : The Generation C – What are the implications for Researchers?